Hansjoakim recently showed us a Flax Seed Rye Bread he baked from a formula Jeffrey Hamelman published in Modern Baking in March, 2009. I have baked a number of Hamelman's rye breads before and a number of his breads with seeds. I have enjoyed them all. 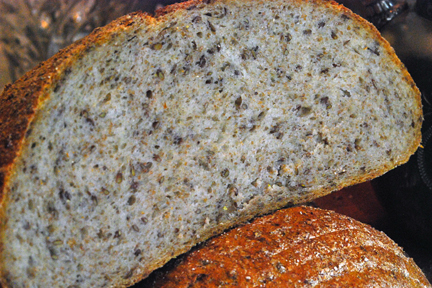 This Flax Seed Rye is a new formula that is not in Hamelman's “Bread,” however. Yet its components are all familiar to anyone who has baked the ryes and multi-grain breads from that book. 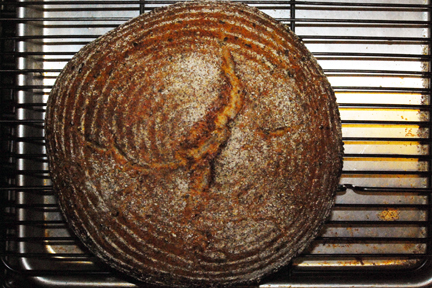 The combination of a 40% Sourdough Rye and a seed and “old bread” (altus) soaker sounded like a bread I'd really enjoy. Hamelman's published formula for this bread is scaled for commercial bakery quantities. I scaled the formula to make a single 1 kg loaf. Method: About 16 hours before the final mix, disperse the mature sourdough culture into the cool water. Add the whole or medium rye flour, and mix until it is incorporated. Sprinkle a layer of rye on top, and cover the bowl with plastic to prevent dehydration. Ripen the sourdough at about 70°F. Method: Make the soaker at the same time you make the sourdough. Cut the old bread into cubes, and put it into a bowl along with the flax seed. Add the water and cover overnight. Remove a portion of the sourdough to perpetuate the culture. Dissolve the sourdough in the water, mix in the soaker, then add the rest of the ingredients and mix thoroughly. The dough will be rather loose. You can adjust by adding small amounts of water or flour, but avoid adding too much flour. Bulk ferment in an oiled bowl for 45-60 minutes. Transfer the boule to a floured banneton. If you used the optional seeds, place it with the seeded side up. If you didn't seed it, place it with the seamed side up. Cover the banneton with a kitchen towel or plasti-crap, or place it in a food-safe plastic bag. Pre-steam the oven. Load the loaf on your baking stone, and steam the oven again. Bake at 440F for about 40 minutes with steam for the first third of the bake. (Note: Hamelman specifies about 38 minutes for a 1.5 lb loaf. For larger round loaves, a longer bake is needed, but be prepared to lower the oven temperature as the bake progresses if the crust appears to be getting too dark. Also note that, if you shape the bread as an oval loaf, the baking time may be less than for a round loaf.) The bread is done when the internal temperature reaches 205F and the loaf gives a “hollow” sound when thumped on the bottom. The "supporting cast" is a couple loaves of Susan from San Diego's "Original" favorite sourdough. My timing was a bit off. The sourdough boules needed just enough more time in the oven to result in the rye over-proofing. 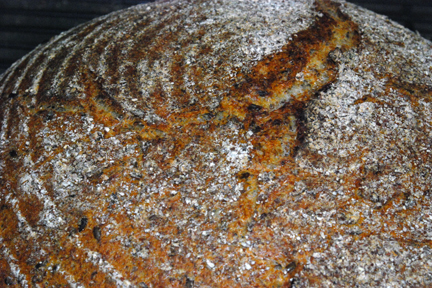 The rye had only modest oven spring and has a lower profile than hansjoakim's bake. In any event, it smells delicious! The crust was quite hard when the loaf came out of the oven. By time it had cooled, the crust was soft. I left it on the counter, wrapped in a cotton cloth for about 20 hours. By the time I sliced it, the crust had firmed up again and was chewy. The texture of the crumb is drier than I expected, given the hydration level of the dough. I wonder how much impact my long mixing had on the dough structure and mouth feel. The flavor of the bread is like that of other 40% sourdough rye breads, which is to say very nice. There is a subtle overtone from the flax seeds which is not as pronounced as that in some of the other 5-grain breads in "Bread." I am thinking of ways I might modify the formula for future bakes. For example, I might use First Clear flour rather than AP. I would make the dough drier - more like what I think Hamelman describes. I might make Hamelman's "5-grain sourdough rye" with some old bread added to the soaker. Thanks again, hansjoakim, for bringing this bread to our attention! The patterns are so pretty! You know, I could never have painted on a design like that. It has to just happen. I'm excited, I've got all the goods needed. Thank you for sharing David and hansjoakim! If this bread tastes half as good as it smells, it's likely to become a regular bake. I've almost finished my boule, and I'm amased by how well this bread keeps. It's four days since I baked mine, and the crumb is still as soft as it was back then. This could be due to the old bread soaker and relatively high hydration? There is definitely a certain, delicate flavour note from the bread soaker - I like it, and think I'll make more loaves with that in the future. Interesting to read about machines devoted to mixing old bread soakers too, huh? By the way, did you let the rye sourdough ripen the full 16 hrs.? I haven't sliced the bread yet. I should wait until late afternoon, but we'll see if I can do it. The only other breads I've made with altus are Jewish Sour rye and pumpernickel. The pumpernickel, which is not a high hydration dough at all, stays moist for nearly a week kept in a bread bag. I let the rye sour ripen for about 14 hours, but, the truth is, it was collapsing by then. My sour is really active. I hadn't refreshed it in over a week, but it ripened the starter in about 10 hours, I'd estimate. Beautiful boules and very nice write-up, David! I too was motivated by hansjoakim's post and his upside down proofing. I have one in the first stages now. Hoping I get a similar pattern on the crust. 45 minutes proofing at 80F would probably be about right. Mine proofed for 60 minutes. Let us see how yours turns out. Beautiful loaves, David. It appears to be scoreless. Am I mistaken? You are not mistaken. The rye was proofed in a brotform with the seams down. It was turned onto a peel and loaded in the oven with the seam side up. The idea is that the seams are the weak spots in the loaf and, with oven spring, they will open up as cuts would. Take a look at hansjoakim's loaf to see how this is supposed to look. There's a link to his posting in my initial entry, above. Because I over-proofed this loaf some, the oven spring and, therefore, the opening of the folds was less dramatic, to say the least. On the other hand, I rather like the effect I did get. By the way, Hamelman does advise scoring this bread in his article, which also has a link to it in my initial entry. There is no way my loaf could have been scored, as wet as it was. This supports my notion that I over-hydrated my dough. But stay tuned. I may find I like it just the way I made it. I just pulled this out of the oven. This is baked with the seam side up like our friend hansjoakim. I made a point out of tightening the ball. I let it sour for a full 14 hours ad maybe a little more. I had some caraway rye chunks in the freezer that I rescued for the soaker. 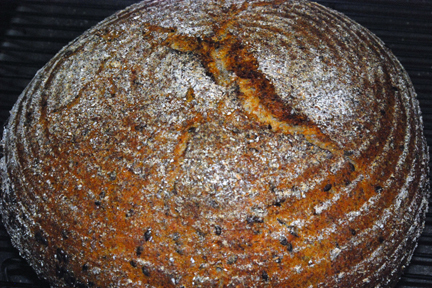 I was surprised that I could still smell the caraway in the final dough from the small amount of seeds i the altus. It looks like it did spring some but I suppose the lack of cuts does hold back the spring some. I'll wait to cut it open until tomorrow AM. BTW the DLX developed this dough in 12 minutes and actually I could of stopped at 10 I think, That was using the hook. I'll add the crumb shot tomorrow. The crumb is moist and full of robust flavor. The crust is now softer and easier to chew but not tough at all. The crumb is not as open as I would have hoped for. It has only been 11 hours since it was baked. You and hansjoakim got very different dough than I did from this formula. It must be the flour I use (Giusto's Baker's Choice.) It's definitely worth trying again with a different flour. I thought hansjoakim said seam side down. In any case that's a beautiful loaf. I like the addition of the caraway seeds. That has great sandwich written all over it! Up and down the seamy side of rye bread. Hmmmm ... It has the makings of a children's song. skimming again when I read..he did say seam side up, WHEN BAKING! Thanks, and so when does your new career debut? I've seen Elmo cooking with Emeril.. I'd rather be a guest on Sesame Street than on Cooking with Emeril. But that's the pediatrician speaking. At rather eat at Emeril's restaurant (again). Gorgeous stuff, guys! By the looks of it, you turned out a perfect loaf as well, Eric! I'm looking forward to the (mandatory) crumbshot. I really think you are on to something here with this natural baking, upside down. The results are beautiful on both yours and Davids top crusts. On my effort, it was near 3:AM when I snapped that image so it was lighted entirely with man made light which shows as more orange tone than is actually the case.I didn't get the striations as dramatically as either of you but I think I know why. My loaf was hard like a rock when it first came out last night. Now that it has set for 7+ hours under a towel it is more normal feeling. This bread smells wonderful! 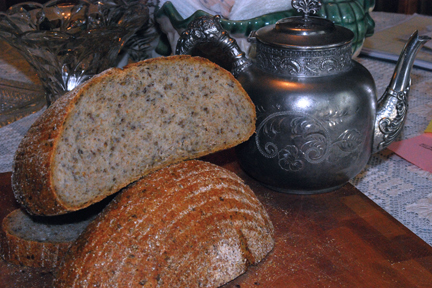 The soaked flax seed develops a terrific aroma when baked. Hansjoakim, I used a common bread flour for the white component (Gold Medal Better for Bread). This is one of the most readily available higher gluten flours sold in the US. I note that you initially thought your dough was to dry and thus added water. I too had that same observation, and added a small amount of water. Later during mixing, I thought I should not have added the additional water and added a similar compensating amount of flour to bring the consistency back to what I have come to expect for a 40% rye. So--It seems like a brief mix followed by a short pause to allow the water to be absorbed would be in order. Using my DLX mixer with the Hook, I had good development at 12 minutes. I then turned it out on the counter and did a slap and fold for a few repetitions to be sure of the development. Using wet hands and counter, it was manageable. I noticed that the boule held shape very well after being turned out of the Banetton. It was standing quite proud on the parchment before baking. I suspect this was due in part to the normal side down baking we are experimenting with here. After all we are dealing with a sticky 80% dough and it is holding shape much better than I am used to seeing. I decided to skip the additional seeds, after starting to sprinkle some flax on the top/bottom after I set the dough in the basket. You can see a few seeds around the girth of the boule that I didn't get to fall out. Seeding the seamed side before dropping in the bannetton might also be a nice effect. I have another set of soaker and sour in process for a second attempt. My first try I used David's numbers and baked it as a single boule which I will do again. Today however I will ignore the urge to change the formula and simply go with the numbers as written. I am going to make an attempt to load some tension into the seam side of the dough by using the onion roll or "Kaiser roll" technique Norm showed us of pulling folds up from the sides in a petal shape. Just one time around with the folds and then I will twist the top to further induce it to unwind during baking. I hope this makes sense. Usually I wait to describe things until after they work. Here, since you are the rye master hasjoakin, I am laying out my strategy for your and Davids comment. Thanks for sharing shots of your crumb, Eric! I thought your boule looked tall and proud from your first photos, but the crumbshot proves what great profile you got. It looks perfect to me - don't you think it would be hard to get it more open given the abundance of flax in the dough? By the way, do you often bake at 3AM? It's interesting to read about you and David's different hydration experiences. For my part, I added everything to the bowl, and used a rubber spatula to hydrate all of the flour. I let it sit a minute or two, and then mixed with the hook for 3 mins. on 1st speed and finished with 3 mins. on 2nd speed. My bread flour is 11% protein, so I guess it develops a bit quicker than higher-protein flours. Using the Kaiser roll technique to get a nice swirl on the top of the loaf sounds really intriguing! That could produce an impressive "maelstrom" pattern on top... Just make sure you twist it and get a sufficiently tight skin so that the boule holds its shape during the first minutes in the oven, and this should be a winner. It's been really interesting to see the different variations and outcomes on the same formula; I guess it reflects our different flours, ovens, steaming techniques etc. It would be fun to do this for other formulas as well! and turning out such beautiful breads! I'm envious. They look so good! My scale just died. (pout...turn away with my head hung low...) I feel like I lost my glove and can't play ball with y'all. So I guess I'm punting recipes until I can find a replacement glove. Congratulations, too, on a very beautiful, successful result. I really liked the flax-seed rye breads I've tried. I can buy toasted flax-seeds, here in Japan, but am running out of the organic, raw seeds that I picked up while overseas, in June. PS: A friend my age (nearly 59) was delighted to learn, last week, how to put the 'degrees' symbol in "440°F" or "230°C" into his posts, emails, WP documents, etc—Hold down the 'Alt' key and type 0176 on the numeric keypad. ° ° °. The "Num Lock" light on your keyboard must be lit. Try it! Those keyboard shortcuts are getting old, as am I.
I don't know German. "Altus" is the spelling used by Greenstein, so I imagine it is Yiddish. "Alte" is the Yiddish world for "old," as in "alte kaker" (old geezer). That language developed during the 16th and 17th centuries from Hebrew and low-German, as I understand it. So some German-derived vocabulary is archaic. Moreover, it was always written using the Hebrew alphabet, so transliteration into the Roman alphabet resulted in different spelling from how modern German script would get "translated," I would imagine. Re. the degree symbol: On the Mac, I find I can get it by holding down the alt/Option key and typing the zero key, as in 205ºF. Thanks for prompting me to discover this. May I call you David? I appreciate the response, very much. My parents spoke several languages, but predominantly, at home, a southern dialect of German that some call "Schwaebisch". I heard the language every day, but never saw anything apart from 'proper German' in written form. 'Schwaebisch' seems to be pretty close to 'Yiddish' in its grammar and I rarely have problems understanding my Jewish friends who speak Yiddish...it's the occasional Hebrew word that confuses me, but since I read a great deal, I can usually cope. I'm glad you found the "prompt" helpful. I hope someone 'blogs' about it. I spend a lot of time writing and editing recipes and the "degrees", "Yen" and "m-dash" symbols are the most-used and most-important shortcuts for me. My second loaf, done yesterday evening at a more sane hour, looks about like yours. There are more striations and cracks. I used the exact numbers in Davids scaling to produce a 1 kilo loaf that fits nicely in my bannetton. After I did the tightening one time around (5 or 6 petals I twisted the dough a 1/4 turn and watched it untwist. Except for the surface flour the dough is fairly slack so I had to work quickly to get the ball into the basket before it unwound, lol. I'm laughing at myself for having this idea. This new JH bread formula is, like his other breads, very flavorful. I didn't get any sour note at all btw. This morning I toasted a large slice and slathered it with the ultimate topping (peanut butter). So luxurious is this topping, we in the US have tried to prevent Europeans from discovering it and instead let them eat Nutella. This is my personal favorite breakfast toast item. I love the look of Davids loaf. The beautiful swirls in his crust are something I would like to achieve. I think the task would be to improve the spring without causing cracking. David mentions trying different flours or combination's to achieve better results. Playing with hydration levels might also bring surprising effects. Thanks again hansjoakim and David for bringing forward this interesting thread. I love the look of Davids loaf. The beautiful swirls in his crust are something I would like to achieve. I believe the "trick" to the swirling pattern is 1) meticulous sealing of the seams, which inhibits their opening up, and 2) slight over-proofing, which decreases oven spring. If you shoot for this effect, I'd like to know whether or not you can achieve it. David, I was looking at the post from Jeff Hamelman and also your image. Yours looks pretty close to his and hansjoakim but my crumb is quite a bit more dense. Jeff's looks like a robust spring going on. I may have to try slashing one. Yeah. Your crumb looks dense. I don't think slashing is the solution, but, in Hamelman's article, he slashed some and baked others as hansjoakim and I did. The crumb I got was pretty much as I expect from my 40% rye breads. I thought the flax seeds would cut the gluten strands and reduce the openness of the crumb. BTW, my wife, who is not the fan of high-percentage ryes I am and turns up her nose at light ryes altogether, loves this bread. She is literally eating it up. Who'uh thunk? 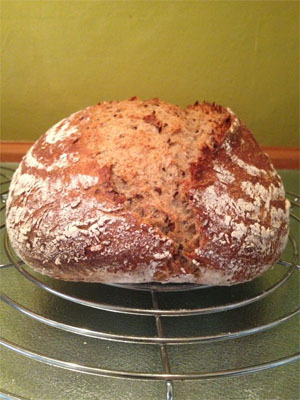 I've made Hamelman's Flaxseed Rye from Bread and this one with the bread soaker looks terrific too. I'm curious that you advise placing the loaf in the brotform with seam up if it is to bake seam up. Why not proof with seam down? I recommended placing the boule in the brotform according to whether or not it was rolled in seeds. I could/should have covered the option of no seeds but proofing smooth side up, I suppose. This bread is now included in the second edition of "Bread". It is my very first bread I make of Hamelmann and I must say: it tasts just fantastic and looks great too! I must say: I'm kind of proud of this bread... What do you guys think?